Manganese plays an important role in photosynthesis. It also promotes the uptake of nitrate. High soil pH and too much available Iron can reduce Manganese availability. Over-irrigation or waterlogged conditions are also detrimental to Manganese availability. 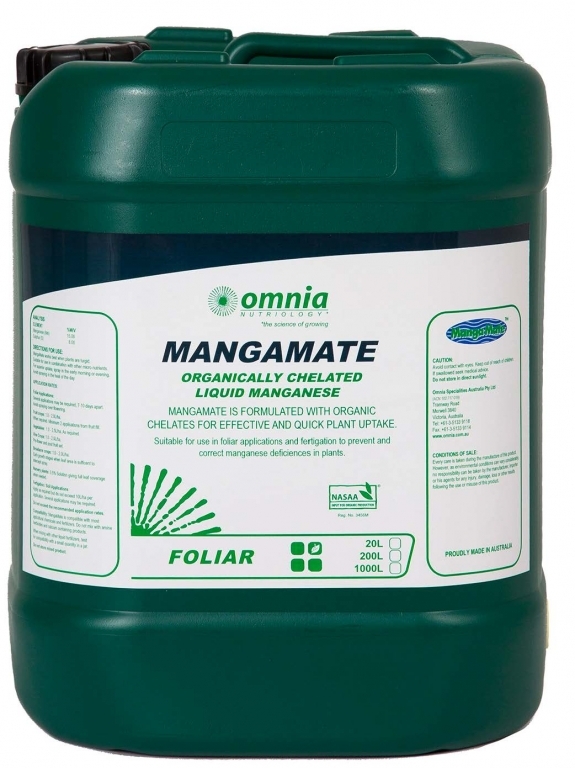 MangaMate is an organically chelated form of Manganese that will improve foliar uptake of Manganese to correct deficiencies. 1.0 – 2.0 litres/ha when required. Minimum 2 applications from fruit fill. 1.0 – 2.5 litres/ha as required. 1.0 -2.0 litres/ha pre-flower and post fruit set. 1.0 – 2.5 litres/ha. Early growth stages. Apply when leaf area is sufficient to intercept spray. 0.5% Solution giving full leaf coverage as required. MangaMate is a NASAA-Certified organic product of choice.